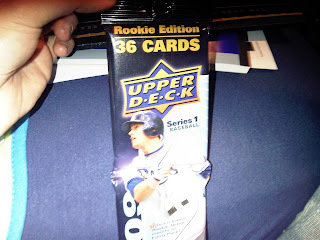 I am a little behind posting some of my findings from K-Mart, but a while back I mentioned that I picked up some 2009 Upper Deck Rookie Edition rack packs. 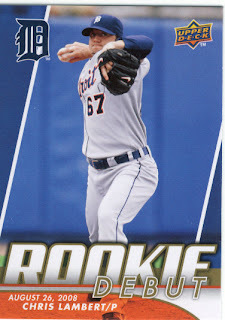 The only reason I got them was because I was curious what the rookie cards looked like, and figured this way would be more fun than looking online for them. Sadly, had I posted this when I bought them I'm sure there probably wouldn't have been as many photo's online but here is what I got from them. 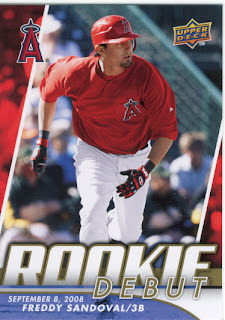 I picked up 2 of these, and aside from the promised 2 Rookie Debut cards per pack I got air. 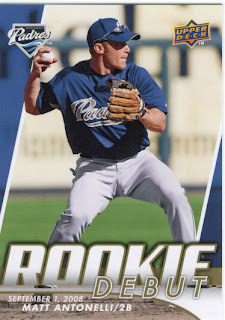 They are pretty cool looking, but if you are seeking a specific player don't bother buying one of these because the rest of both of them were just plain old boring base cards. 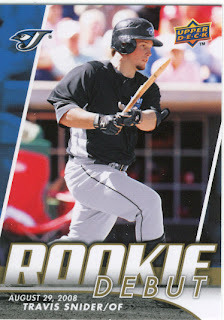 Out of the four cards, my favorite two are Snider and Antonelli. I'm not going to start collecting either of them, but those were the ones I liked. The K-Mart that is closest to me just started getting more 2009 products in as I mentioned, and I am hoping that they have a little more variety in the upcoming weeks and specifically when the OPC is released. It seems as though where I live there are a bunch of people who collect cards because if you don't hit the local Targets at the right time, they are consistently out of new release products. It is probably better that way since I really shouldn't be buying anything anyway. If anyone needs any of these 4 cards, let me know we can work out a trade though I must warn you my post office time is becoming limited to what seems to be Friday and Saturday with the occastional weekday trip. Let's hope you don't get Bipped at your KMart! I believe the whole deal with Upper Deck fat packs over the years is that you get the two exclusive inserts and nothing else. Basically, they're good for set collectors unless you really want the one insert set. If no one takes you up on those cards, I just might. For whatever reason, I just like the way they look.